(PIKESVILLE, Md.) 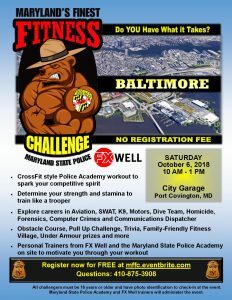 — Get CrossFit ready for fall with fitness trainers from FX Well and the Maryland State Police Academy and register free online to guarantee your spot in Maryland’s Finest Fitness Challenge, set for Saturday, October 6. This year, the free event takes place at the City Garage in Port Covington in South Baltimore. Register online at mdsp.maryland.gov for the challenge and be sure to check in before the warm-up begins at 9:45 a.m. The race to the finish line starts promptly at 10 a.m. The first 200 finishers receive a free T-shirt. 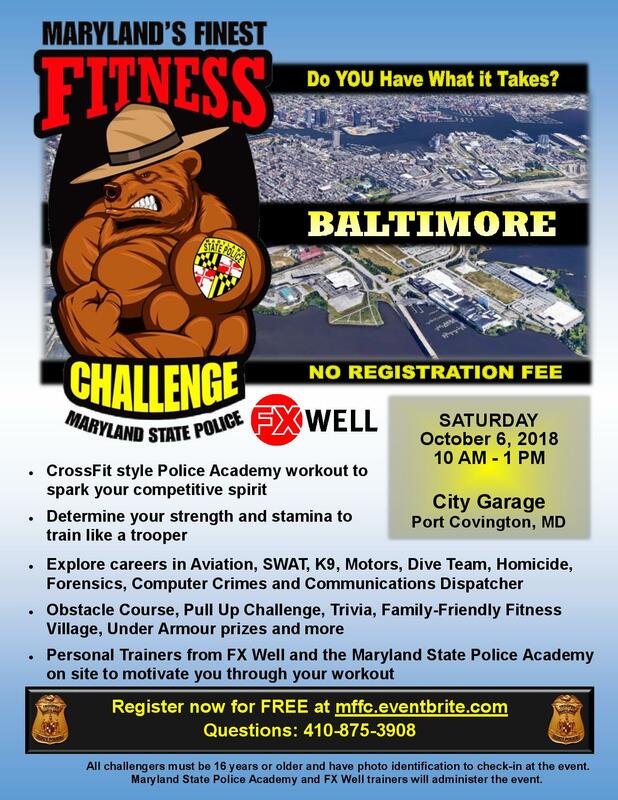 The Maryland State Police Fitness Challenge is a CrossFit style workout designed to spark your competitive spirit. The course includes a two-mile fun run with obstacles and exercise stations. Personal trainers from FX Well and the Maryland State Police Academy will be on site to motivate you through your workout. In addition, the event features a pull-up challenge, trivia, a family-friendly fitness village, prizes and more. Online registration is required for the event and you must be at least 16 years old to participate. All participants must check in prior to 9 a.m. to be eligible for the race and the giveaways. In addition, those in attendance are invited to explore careers in the Maryland State Police. Personnel from specialized units will be available for demos and to talk about careers in aviation, SWAT, K-9, motors, dive team, homicide, forensics, computer crimes and communications. For more information on how to register for the event and/or careers with the Maryland State Police, visit the department’s web page.